The top 43 ranked players from the ATP World Tour are entered. 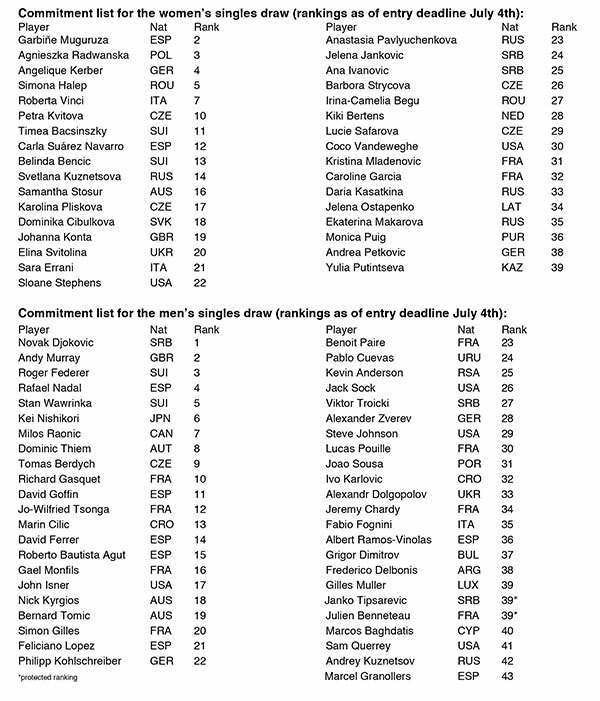 33 of the top ranked eligible 37 players from WTA are committed. The tournament is reserving four men’s and three women’s Wild Cards for automatic entry of players not on the initial lists. The Western & Southern Open announced today the 43 highest-ranked men on the ATP World Tour are entered to play the event in August. Joining them are four of the Top 5, and 33 of the highest ranked eligible 37 women on the WTA*. ESPN commentator Chris Fowler helped make the announcement at a media event held in downtown Cincinnati. Organizers also announced additional fan experience upgrades including an updated smartphone app, new Family Zone, and increased broadcast coverage. The event will be held August 13-21 at the Lindner Family Tennis Center in Mason, Ohio. The initial entry lists from each tour include 32 players – 15 men and 17 women – who have combined to win 43 titles this season. 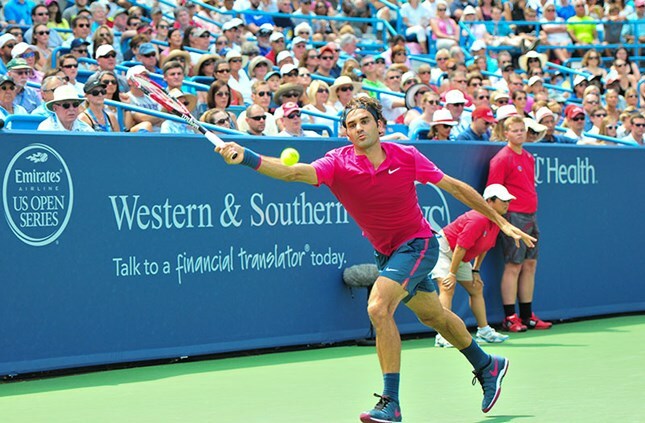 The men’s entries include Roger Federer, who has won a record seven Western & Southern Open titles; two-time champion Andy Murray and five-time finalist Novak Djokovic, who recently completed a career Grand Slam and needs only this title to complete a set of titles from each ATP World Tour Masters 1000 events. The men’s field also includes six rising stars who are under the age of 24: 19-year-old Alexander Zverev (ranked 28), 21-year-old Nick Kyrgios (18), 22-year-olds Lucas Pouille (30) and Dominic Thiem (8), and 23-year-olds Bernard Tomic (19) and Jack Sock (26). 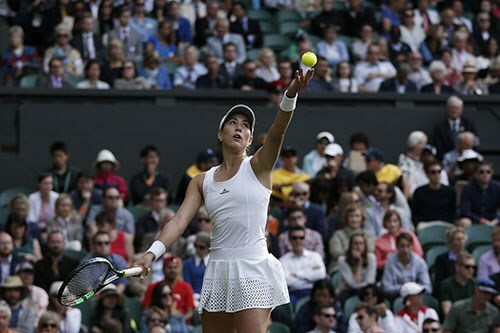 The women’s entries include six winners of Grand Slam tournaments, including the champions from this year’s first two events: Angelique Kerber (Australian Open) and Garbiñe Muguruza (French Open). Seven other women’s entrants have reached the finals at a Grand Slam event in their career. Two Americans - Sloane Stephens, who has won a WTA-leading three titles in 2016, and CoCo Vandeweghe, who has won 11 of her last 13 matches – are also among the entrants. In addition to the above, the tournament will issue wild card entries to three women and four men. Any player who is not on the entry list is eligible to receive a wild card. Those wild cards are given at the discretion of the tournament and can be awarded up until the time of the draw on Friday, August 12. The tournament is an ATP World Tour Masters 1000, making entries automatic for top-ranked players. For the women, it is a WTA Premier 5, a tournament class of five events that players are required to play four of each season. The men’s field includes 56 players, however the women’s field has been reduced to 48 players this year given the Olympic tennis competition in Rio the week preceding the Western & Southern Open. Seven men and 12 women will be added to the fields via the qualifying tournament that will take place August 13-14 at the Lindner Family Tennis Center. Tickets still available. To purchase, or for more tournament information, please visit www.wsopen.com. *Rankings as of entry deadline, July 4.